Reading and share top 2 famous quotes and sayings about Multiple Universes by famous authors and people. Browse top 2 famous quotes and sayings about Multiple Universes by most favorite authors. 1. "Again and again across the centuries, cosmic discoveries have demoted our self-image. Earth was once assumed to be astronomically unique, until astronomers learned that Earth is just another planet orbiting the Sun. Then we presumed the Sun was unique, until we learned that the countless stars of the night sky are suns themselves. Then we presumed our galaxy, the Milky Way, was the entire known universe, until we established that the countless fuzzy things in the sky are other galaxies, dotting the landscape of our known universe.Today, how easy it is to presume that one universe is all there is. 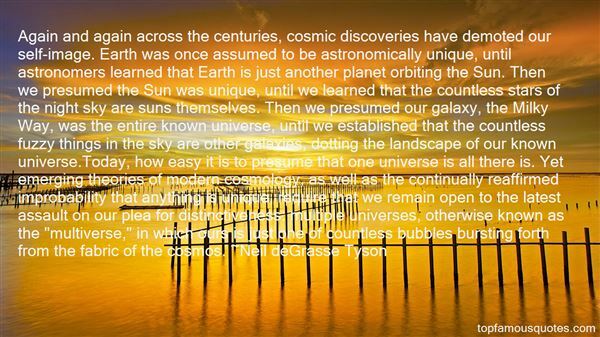 Yet emerging theories of modern cosmology, as well as the continually reaffirmed improbability that anything is unique, require that we remain open to the latest assault on our plea for distinctiveness: multiple universes, otherwise known as the "multiverse," in which ours is just one of countless bubbles bursting forth from the fabric of the cosmos." 2. "Are there any alternatives? Well, there is the hypothesis that this universe is not unique, but that all possible universes exist, and we find ourselves, not surprisingly, in one that contains life. But that is a cop-out, which dispenses with the attempt to explain anything. 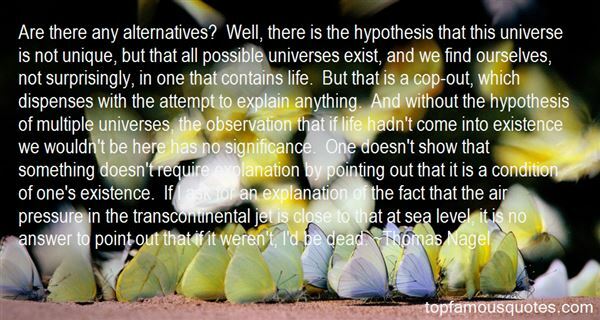 And without the hypothesis of multiple universes, the observation that if life hadn't come into existence we wouldn't be here has no significance. One doesn't show that something doesn't require explanation by pointing out that it is a condition of one's existence. If I ask for an explanation of the fact that the air pressure in the transcontinental jet is close to that at sea level, it is no answer to point out that if it weren't, I'd be dead." How do you file a restraining order against sadness?"